ABOARD THE PAPAL PLANE – Pope Francis urged nations Thursday to take in as many refugees as they can integrate into their societies, but also to invest in places like Africa so migrants won’t turn to human traffickers to reach countries that can offer a better life. 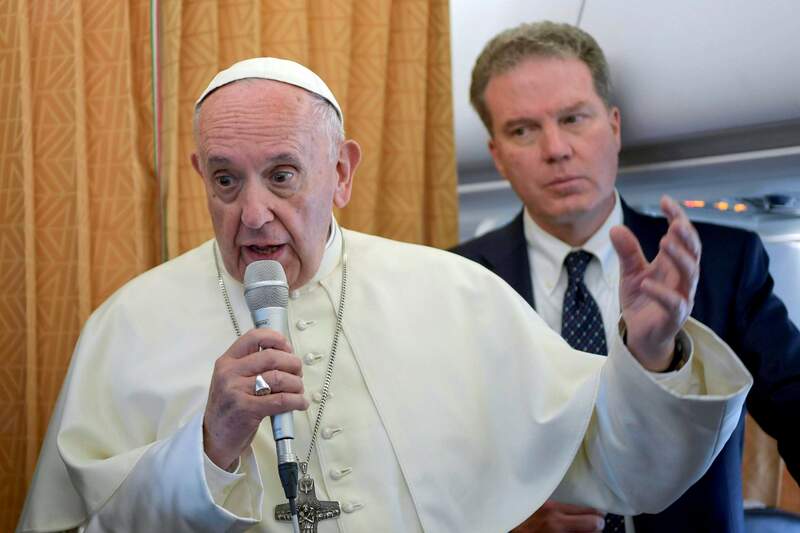 Speaking to reporters on his airplane as he flew back to Rome after a visit to Geneva, Francis also reiterated that he supports the Roman Catholic bishops in the United States who condemned the immigration policy of separating children from parents who enter the U.S. illegally. On Wednesday, U.S. President Donald Trump reversed a policy of separating immigrant children from their parents after being detained entering the United States without permission. Francis was asked both about the separation policy as well as Europe’s struggle with a flood of migrants rescued in the Mediterranean from human traffickers’ boats. Italy’s new populist government is trying to discourage more arrivals of rescued migrants. He praised both Italy and Greece for being “most generous” in taking in migrants rescued at sea, and said all governments should take in as many refugees as their countries can handle. “Each country must do this with the virtue of government, which is prudence, and take in as many refugees as it can, as many as it can integrate, educate, give jobs to,” said Francis, who for years has urged nations to be more welcoming to those fleeing war and poverty. “We are living through a flood of refugees who are fleeing war and hunger” as well as persecution, Francis said. Francis endorsed European proposals to develop jobs and education in African countries. Italy and some other European Union nations that have borne the brunt of the migrant crisis have been pushing for more development aid to Africa so poor people there won’t risk their lives in the hands of traffickers in hopes of reaching Europe and a better life. “So many European governments are thinking of an urgent plan to intelligently invest in those countries, to give jobs and education,” Francis said with approval. He noted that in Latin America, including his own homeland of Argentina, many people migrate internally, leaving the countryside for big cities, only to end up living in shantytowns. The pope also expressed deep dismay that migrants on smuggler boats are turned back in Libyan waters, returning them to lawless Libya, where traffickers are based and where desperate migrants are thrown in prisons to face torture and other abuse. “The traffickers’ prisons are terrible, terrible, like the concentration camps of World War II,” Francis said. Francis’s trip to Geneva was aimed at promoting unity among Christians, including by concretely working together for peace and justice in the world.